THE PENTAGON – The Navy is considering increasing its future frigate’s anti-air firepower and may open up the frigate design competition to hulls beyond the current two small surface combatants, the service told USNI News on Wednesday. An ongoing study will balance the original frigate requirements – to up-gun the existing Littoral Combat Ship designs with additional anti-surface and anti-submarine capabilities – with the desire for anti-air firepower equivalent to a guided-missile frigate. 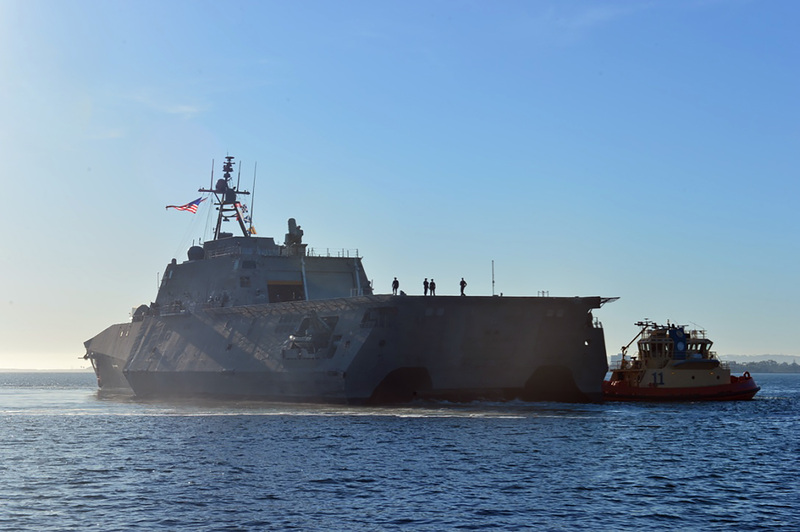 The study, set to be completed this spring, will also evaluate other design beyond the Lockheed Martin Freedom-variant (LCS-1) and Austal USA Independence-variant (LCS-2) hulls. “The Navy is pursuing an update to the analysis performed by the 2014 Small Surface Combatant Task Force (SSCTF) to reassess frigate requirements and capabilities,” reads a Navy statement provided to USNI News. The update follows the release of the Navy’s December force structure assessment that called for 355 ships, the service said in its statement. “We’re looking at several things in the context of the Force Structure Assessment,” Acting Secretary of the Navy Sean Stackley told Defense News earlier this month. News of the study also closely follows repeated calls for a revamp of the frigate strategy by Senate Armed Services Committee Chairman Sen. John McCain (R-Ariz.) that would open up the competition to more foreign and domestic designs. “The frigate acquisition strategy should be revised to increase requirements to include convoy air defense, greater missile capability and longer endurance,” McCain told reporters in February. The new study is a marked departure from the Navy’s initial 2014 concept for the frigate, which would have just added over-the-horizon anti-ship missiles and expanded anti-submarine warfare capabilities to each existing LCS hull. Reevaluating the frigate requirements also comes after two Congressionally mandated studies called for a more powerful small surface combatant with capabilities that would complement the Navy’s existing fleet of guided-missile destroyers. “You’re really concentrating your fires in the fleet the Navy wants to have, and we’re arguing for a much more distributed surface fleet by taking advantage of some of the technologies you can get on some of these smaller combatants,” Bryan Clark, lead author of a Center for Strategic and Budgetary Analysis (CSBA), fleet architecture study told USNI News in February. 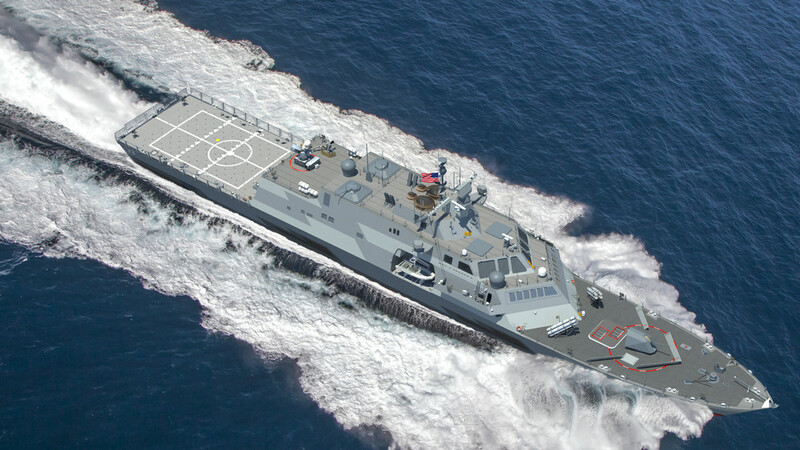 The CSBA study called for a guided-missile frigate that would include a MK-41 vertical launch system, anti-surface missiles and a significant air search radar. In its study, MITRE called for scrapping the LCS concept and starting with a clean sheet design for a next-generation frigate. Earlier this week, Defense News reported the frigates’ local air defense role would be tasked to extend an anti-air warfare protection bubble over the Navy’s combat logistics ships. Early estimates indicate the frigate would need to field 16 Block 2 Evolved Seasparrow Missiles, or at least eight MK-41 vertical launch system cells fielding Standard Missile 2s. Since the 2014 mandate from then-Secretary of Defense Chuck Hagel to create a small surface ship with capabilities beyond the Flight 0 Littoral Combat Ships, the Navy has been working with Lockheed Martin and Austal USA on refining the requirements for what the service wants in a frigate. 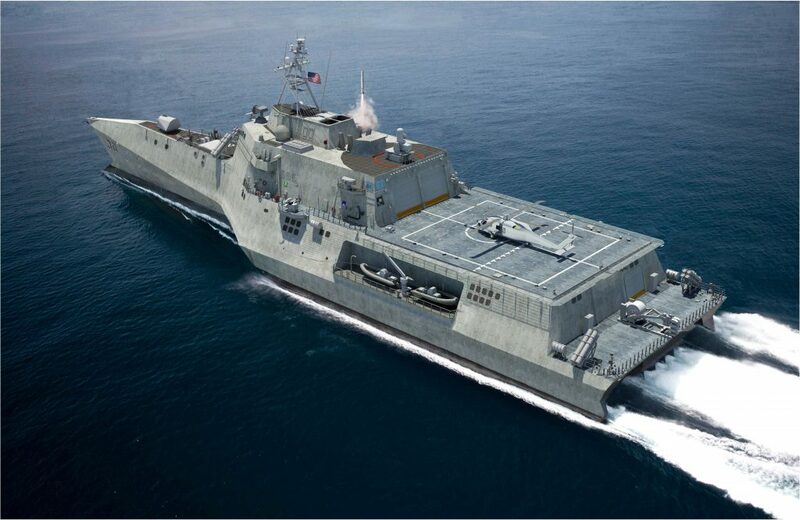 Tim McCue, Austal USA’s vice president for LCS, said so far the process identified four areas important to the service for the new design: inclusion of an anti-ship surface-to-surface missile, expanded range, higher-end electronic warfare capability, and adding endurance to the ship. “Those are the things we know about, but until they tell us ‘this is what we want and this is how we value it,’ we have to weigh those against cost. I’m very worried about cost on this ship,” he said. During the Navy League’s annual Sea-Air-Space exposition, Austal USA revealed its current idea for a frigate offering, which included 16 VLS cells, up to 16 OTH anti-ship missiles, accommodation for 130 crew, space for Surface Electronic Warfare Improvement Program (SEWIP) Block II electronic warfare suite, and a variable depth sonar. Likewise, Lockheed has added an additional anti-air capability in the form of VLS cells, a variable depth ASW array and space for OTH missiles on a 118-meter hull design. Both hulls have a crew size of about 130 and have turned the LCS’s configurable mission space into additional berthing space. While both companies claim about equivalent capabilities to meet the Navy’s current plan for the frigate, it remains to be seen how they will need to change to correspond to new requirements that may emerge from the ongoing study. “We’re not trying to solve whatever CSBA or MITRE has come up with,” Terry O’Brien, vice president of Austal USA business development, told USNI News last week. The look at other hulls – potentially foreign designs – could bring in additional competition beyond the two yards. While the U.S. has not focused on traditional small naval ship designs, Western European shipbuilders have designed several guided-missile frigates that could partner with U.S. companies for a new frigate bid. The new study and the expansion of the hulls under consideration call into question when the service will release the final Request for Proposal for the final frigate design, which was due sometime this year. “While the design for the frigate matures, the Navy remains firmly committed to execution of the current LCS program of record, in order to maintain the viability of both shipyards, maximize competition for future ship contracts and deliver critically needed capability to the fleet as quickly as possible,” read the statement from the service. The following was the complete statement from the Navy on the ongoing frigate study provided to USNI News. As a result of the Navy’s 2016 Force Structure Assessment, increased emphasis on Distributed Maritime Operations, and increasingly complex threats in the global maritime environment, the Navy continues to assess the capabilities required to ensure the Frigate outpaces future threats. Therefore, the Navy is pursuing an update to the analysis performed by the 2014 Small Surface Combatant Task Force (SSCTF) to reassess Frigate requirements and capabilities. The Navy Frigate Requirements Evaluation Team (FFG RET) will update the SSCTF analyses to investigate the feasibility of incorporating additional capabilities such as Local Air Defense and enhanced survivability features into the current LCS designs, as well as explore other existing hull forms. The result of this update will inform PB18 deliberations, and will be briefed to OSD leadership and the Congressional committees once completed later this spring. Our goal is to get the best capability possible in our future Frigate, at an affordable price, and with a mature design that will ensure a relevant platform for decades to come. While the design for the Frigate matures, the Navy remains firmly committed to execution of the current LCS program of record, in order to maintain the viability of both shipyards, maximize competition for future ship contracts, and deliver critically needed capability to the Fleet as quickly as possible.